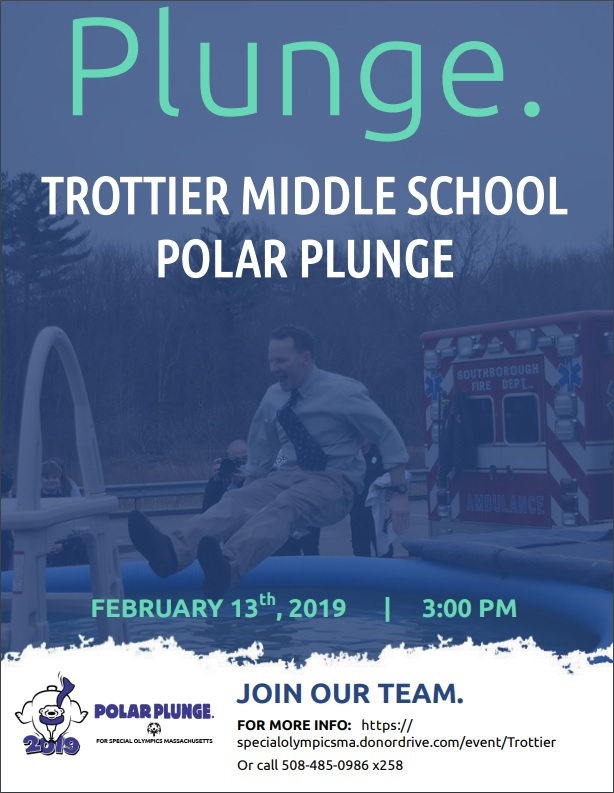 For the second winter, Trottier Middle School is hosting a Polar Plunge to support Special Olympics. 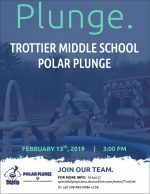 For the SECOND TIME, the brrrrrrave students of Trottier Middle School are taking the Plunge and raising funds for the athletes of Special Olympics Massachusetts. We’ll be bringing the pool back in the parking lot on Wednesday, February 13th, for a quick dip after school. Whether you have plunged before or not, join us to experience this fun event! But it’s not only students who will be making the leap. Based on last year’s event, expect to see some faculty, administration and even public safety personnel getting soaked. Registration opens immediately after school lets out at 2:30 pm and continues until 2:45 pm. Following registration will be a safety briefing. Plunge launches at 2:45 pm sharp! The entire event will wrap up in time for the late buses at 3:50 pm. To sign up, learn more, or support a plunger, click here.